Young Paul was born in a small village called Mangad near Kunnamkulam August 30, 1946 to the ancient Syrian Christian family of Kollannur to K. I. Ipe and Kunjeetty. Paul was baptized at his home parish, St. Mary 's Orthodox Church, Pazhanj. From his early childhood Paul showed keen interest in spiritual matters. His home parish, played an important role in his spiritual growth. At the age of 13, he was selected by his parish priest to be one among the twelve in the â€˜Washing of Feet Service ' by His Grace Paulose Mar Severios, Metropolitan. This marked a turning point in the life of young Paul when Metropolitan Mar Severios saw the making of a priest in his character. The influence of his parents especially that of his mother who hails from the famous Pulikkottil family, played a great role in the molding of his spiritual life. Even from his childhood, he took great interest in Syriac chants and prayers and was very keen in attending all liturgical services in the Church. Following his interests and his leaning towards the Orthodox Faith, young Paul joined the Orthodox Theological Seminary from where he secured GST and Bachelor of Divinity from the Serampore University. His Grace Yuhanon Mar Severios of Blessed Memory ordained him to the Subdiaconate at the Holy Pilgrimage Center of the Church, St. Peter & St. Paul Church, Parumala on April 8, 1972 and to the full Diaconate at Sion Seminary, Koratty on May 31, 1973. He was ordained to priesthood priest by his spiritual father, Yuhanon Mar Severios Metropolitan, at Sion Seminary, Koratty on June 2, 1973. Fr. Paul served as a model shepherd of St. Marys Orthodox Church Ernakulam, Moolepat Orthodox Church Pazhanji, St. Mary 's Magdalene Convent Adappotty, Kummanmkulam and Medical College Chapel Kottayam. The Malankara Syrian Christian Association held at MGM Thiruvalla on December 28, 1982 elected Fr. Paul as Metropolitan. His Grace Mathews Mar Coorilos, (later His Holiness Moran Mar Baselius Mar Thoma Mathews II) of Blessed Memory, professed Fr. Paul to Monastic Orders (Ramban) May 14, 1983 and was later consecrated as Metropolitan Paulose Mar Milithios by His Holiness Moran Mar Baselios Marthoma Mathews I, of Blessed Memory. His Grace, had the blessing of being appointed to the Episcopal Throne of the newly formed Kunnumkulam Diocese on August 1, 1985. The Holy Episcopal Synod and the Managing Committee nominated His Grace to be the Successor to the Catholicos of the East and Malankara Metropolitan on September 27, 2006. 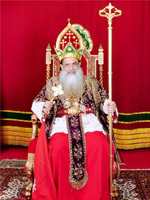 His Holiness was enthroned as the Catholicos of the East on November 1, 2010.